Our son, Daniel Ray Underwood, 33, died of a shotgun wound to the head on September 4, 2008, while engaged in an altercation with his girlfriend, Rebecca Nelson, in a home they shared in Sulphur Springs, Texas. Earlier that evening, Daniel, Rebecca, and a couple of friends, Robin and Maria, had been at a bar together. Maria had accompanied the couple back to Daniel’s house, where Rebecca was living. According to Maria, once there, Daniel and Rebecca got into a heated argument, and Maria fled the room. A short time later, she returned and saw Daniel in the hallway between the bedrooms. He was holding a shotgun in his right hand and confronting and accusing Rebecca of taking a large sum of his cash that he had discovered missing from a jar he kept on the mantle. 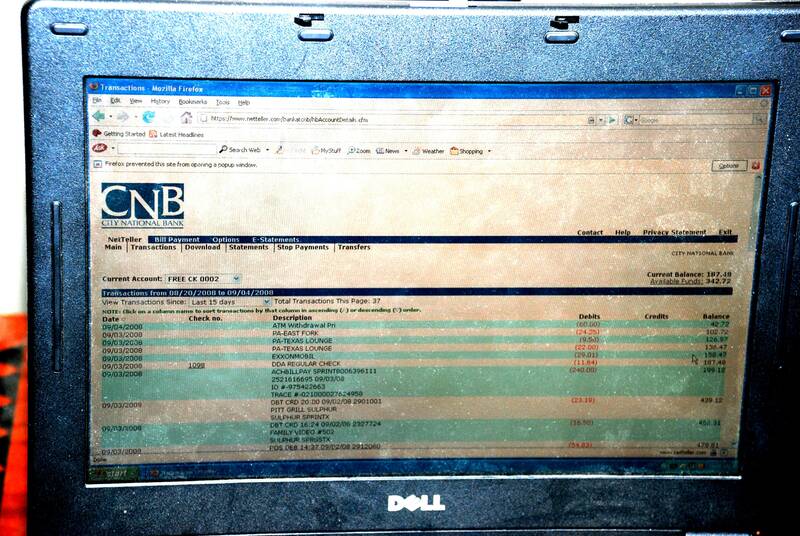 Actually, Rebecca confirms this part when she states in her own words, during a police interview that “there was a big sum of money that was gone.” According to the police reports, someone had been logged into Daniel’s bank account which showed he only had a balance of $42 in it. This was all the money Daniel had left after receiving $25,000 from his 401K retirement fund and a bank loan on his truck for $1,500 in less than a month’s time. Maria stated that, after he discovered this, Daniel seemed to be trying to scare Rebecca into confessing that she was responsible for “cleaning him out” and putting him in debt. Rebecca grabbed the gun again, and the two started struggling. 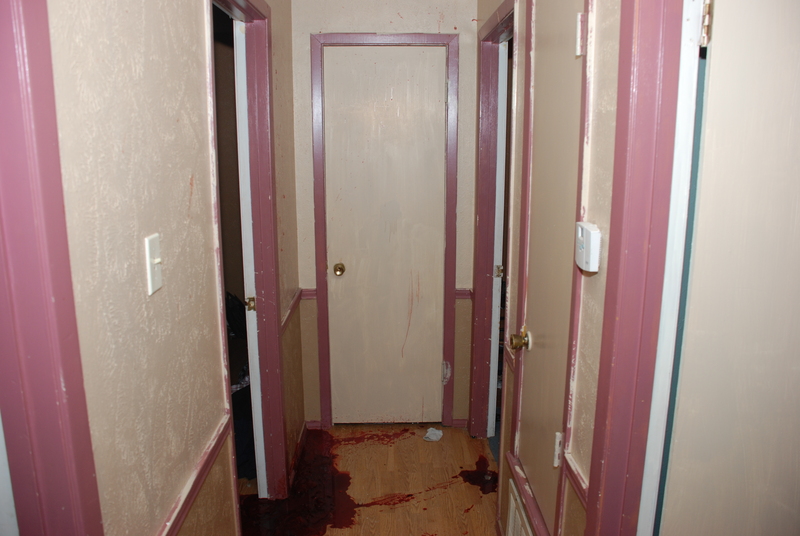 Maria again ran from the room, and a few seconds later heard the gun go off as she was stepping back into the hallway. She saw Daniel fall to the floor, where he landed on his side, curled into a fetal position. Maria immediately wanted to call 911. Rebecca cried, “No, no wait! No! Hold on! Wait!” as if giving herself additional time to get things sorted out before the authorities were called. Later, she told Maria she didn’t want to open the door for the rescue personnel because her cats might get out. 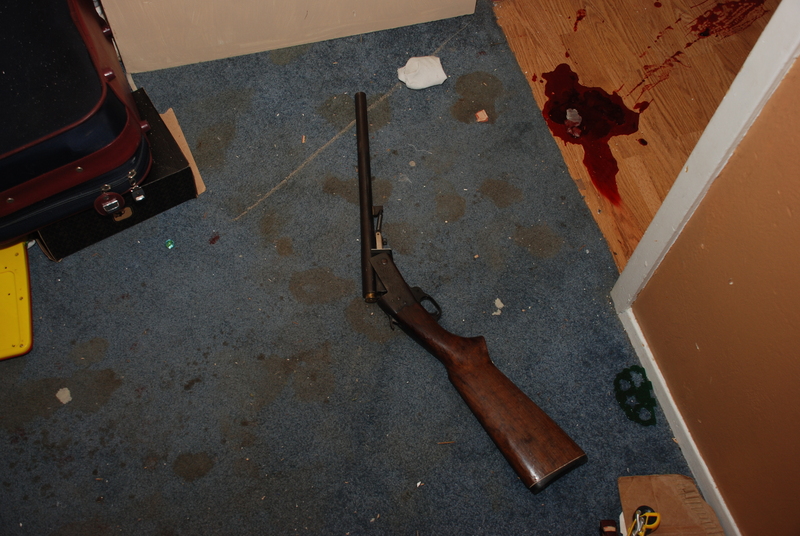 She snatched up the gun from the hallway, where it had fallen, and shoved it into the bedroom. She, then, after two or more strenuous attempts, managed to turn Daniel over onto his back, (which is the position in which she told police he landed), and positioned him so that his feet protruded into the bedroom and were on top of the gun. Before finally calling 911, she told Maria that she was not to tell the police that Rebecca and Daniel had been fighting. Although they had been together for only two months and Rebecca was still married when she moved in with Daniel, she was already telling friends that she was tired of him, was going to get as much money from him as possible, and then would leave him and get back with one of her old boyfriends. Also, a few weeks prior to the shooting, Rebecca was telling people that Daniel had made her the beneficiary of his life insurance. Even before Daniel took his last breath, Rebecca considered everything he owned to be hers. She was making statements to this effect to Maria and others whom she called from Daniel’s cell phone while he lay dying in the hallway of his home. The first question she asked when interviewed at the police station was if they would give her Daniel’s wallet before she left. When I called her later in the morning of the same day Daniel was shot to ask if we could get his truck and his cell phone while we were in town, she went into a rage, cussing and insisting that they belonged to her now and that she had already consulted with the police and her attorneys about this. The following evening she went to a bar and attempted to sell Daniel’s wedding ring from his recent marriage and some of his favorite pool cues. She left the bar with a man with whom she spent the night. 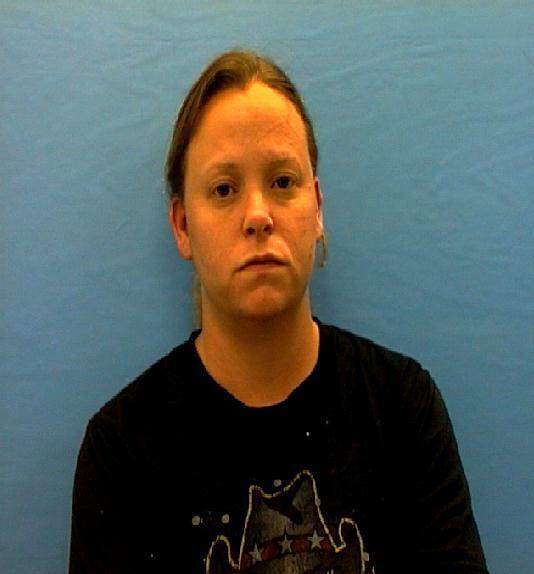 The first investigators at the scene were members of the Sulphur Springs Police Department. Because they classified the shooting as a questionable death, based on the fact that the gun was broken open as if someone had attempted to eject the spent shell casing and the victim was lying on the weapon, the Texas Rangers were called in to assist. During one of her interviews, Rebecca made reference to the fact that she “helped” the police “with tips on cases,” and Detective Lenwood “Bo” Fox acknowledged that she had “talked to him a couple of times on a couple of different cases.” She also referred to Det. Fox as her “good friend Bo”, and he treated her as such. This suggests to me that she may have been a confidential informant and had a reciprocal relationship with Det. Fox and the police department which kept her out of trouble with the law. She, herself, had been arrested on several occasions, at which times she had been handled with kid gloves. Our family does not believe that Daniel’s death was a suicide. Much of the content of the Medical Examiner’s report appears to have come from erroneous statements by Det. "Bo” Fox. Det. Fox told the ME that Daniel had no children. That’s a total lie. Daniel had two sons as well as a stepson, Jonathan, whom he had raised since he was a little more and a year old and whom he considered to be his own. He also had two other stepchildren, Ashlyn and Dylan, from his latest marriage and had grown to love them very much as well. He was a devoted father to all of them. He referred to his youngest son, Zane, as his “mini-me,” because they looked and acted so much alike, and from the time of Zane’s birth took almost total care of him. He was thrilled because his oldest son, Damien, who had just turned twelve, was talking about moving in with him. Rebecca liked to pretend those children didn’t exist. Det. 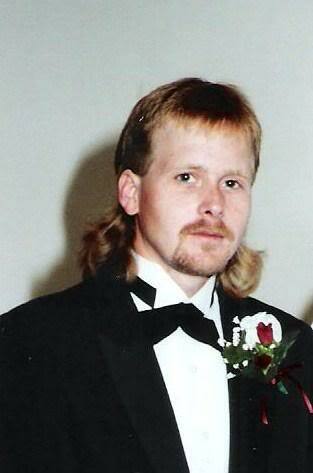 Fox also stated that Daniel had a history of alcoholism and depression. 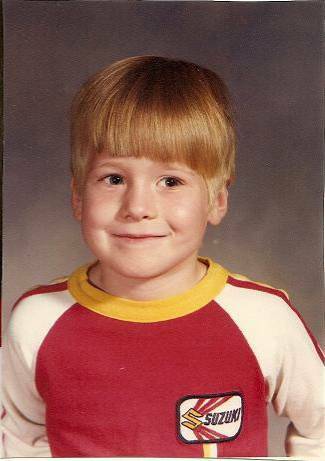 While it’s true that in younger days Daniel did party with friends and had acquired several DUIs, he was not an alcoholic, and those days of irresponsible youth were behind him. Until his divorce, which had just been finalized, (his wife had fallen in love with another man), he had been a dedicated family man whose life revolved around his wife and children. He had no history of depression. At the time of his death, he had made plans for the coming weekend that included four of those children. Rebecca herself, in an apparent slip-up during one of her interviews, stated that Daniel’s personality was even and moderate and he never seemed depressed. Even statements in the autopsy report raise question. According to that report, the bullet wound was slightly left to right, which would not have been a natural angle for a right-handed person to assume if he was committing suicide. The person who wrote that report was not given the information that Daniel was right handed. There were also bruises all over Daniel’s body, suggestive of domestic abuse, which were not mentioned in the autopsy report or police reports, although they were evident in crime scene photos and in photographs taken at the autopsy. The police investigation was far from competent or complete. They collected virtually nothing from the scene, and the gun was not dusted for prints. The police did not secure the house, or allow our family time to inspect it before leaving it open for unauthorized people to enter and take Daniel’s belongings. Rebecca deleted information from his laptop and cell phone which she took from his house before we were allowed to see them. 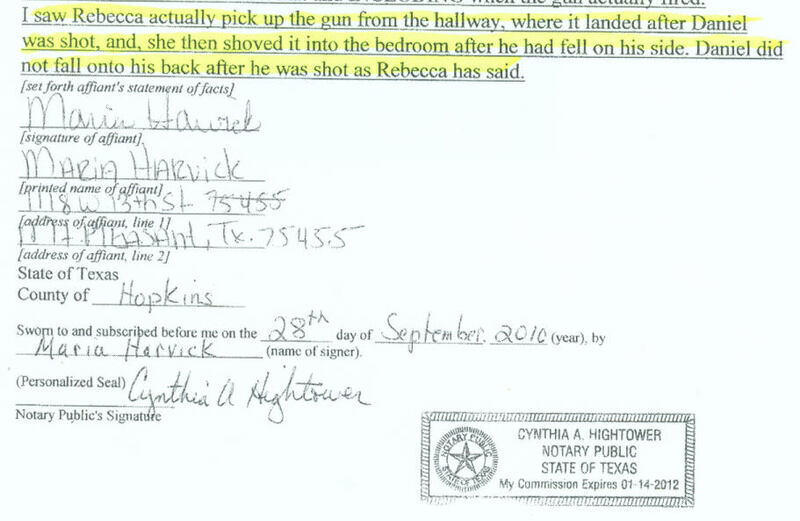 Police did not question the conflicting versions of Rebecca’s story, although she continually contradicted herself. 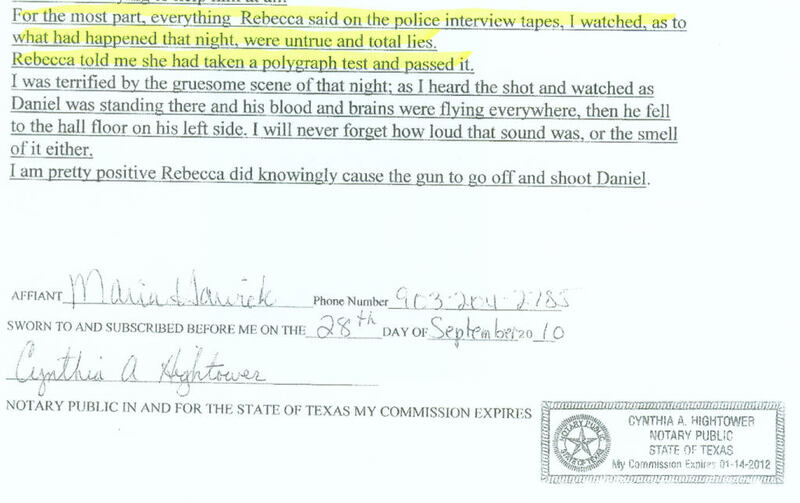 When first interviewed by police, Rebecca said that Daniel, without speaking, bent his head over the barrel of the gun and pulled the trigger. In her second interview, she said she and Daniel were standing six inches apart, facing each other, when the gun fired. Maria stated Daniel was in mid-sentence when the gun went off. Det. Fox, (“good friend Bo”), had no interest in the version given by Maria, the witness at the scene, who had no reason to fabricate what she saw and heard and directly refuted Rebecca’s statements. Rebecca agreed to take a polygraph test about the facts of that evening but backed out after consulting with her attorney. However she told numerous people that she did take the test and passed it with flying colors. Daniel was a good person – a loving son – a devoted father – a hard worker. Despite the fact that the ME report states that his occupation was “unknown,” suggesting that he was a vagrant, he had worked seven years at Hydro Aluminum on a rotating shift, working twelve hour days and nights and every other weekend. He had recently quit that job in order to search for one with a regulated schedule that would allow him more time with his children. What our family is requesting is not that any particular person be charged with murder. We want the cause of death on Daniel’s death certificate to be officially changed from “suicide” to “undermined.” That would make it possible for Daniel’s case to be reopened. Then, we want the investigation turned over to an outside agency at which the investigators have no personal relationship with Rebecca or anyone else involved with the case.